A couple of weeks ago I noticed a large clump of well-aged Sulfur Shelf (Laetiporus sulphureus) mushrooms on a large, fallen tree. On the same tree further down the trunk now log were a few orange freshly sprouted mushrooms that appeared to be Galerina marginata. It struck me that a number of cycles were intertwined and represented on this log. 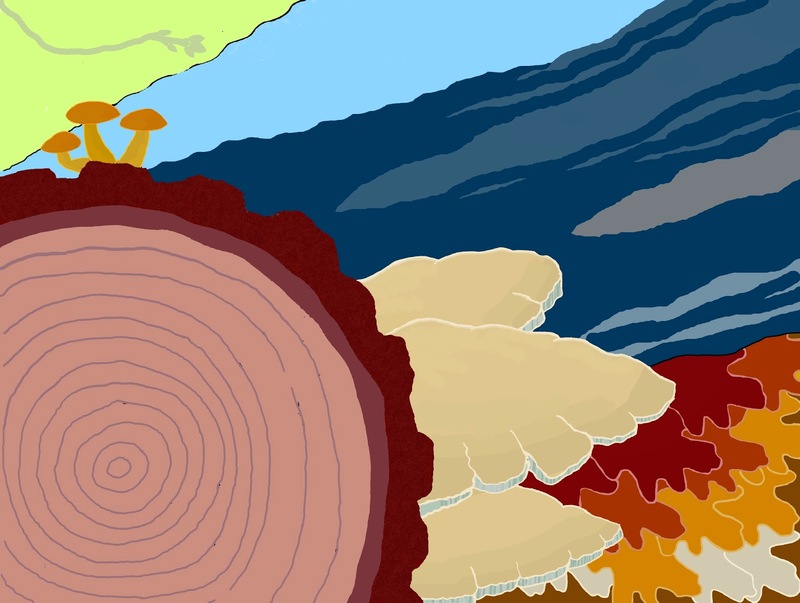 There was the end of the tree's life cycle, very possibly caused by parasitism of the Sulfur Shelf mushroom. Then there was the cycling of the tree's nutrients back into the soil, aided by the saprobic G. marginata. And also the seasonal cycle of mushroom fruiting, with the Sulfur Shelf most likely being one of the last fungi to fruit last fall, and G. marginata being one of the first of this year's spring.